If you're an Environment Admin, Office 365 Global Admin, or Azure Active Directory Tenant Admin, you can manage the apps created in your organization. PowerApps Environment Admin, Office 365 Global Admin, or Azure Active Directory Tenant Admin permissions. For more information, see Environments administration in PowerApps. In the navigation pane, click or tap Environments, and then click or tap the environment that contains the app that you want to manage. 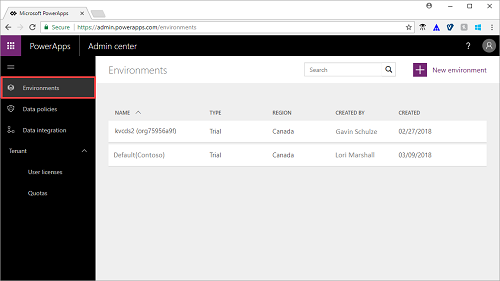 If you don't see Environments in the navigation pane, that indicates you don't have a PowerApps Plan 2, Microsoft Flow Plan 2, or PowerApps Plan 2 trial license. On the Resources tab, click or tap Apps, and then click or tap the app that you want to manage. This takes you to the app Details page. Click or tap the trash can icon to delete the app. View data connections, flows, and other details associated with the app. Click or tap Share to view or modify the users with whom the app is shared. Check out other how-to guides to learn what else you can do from the PowerApps Admin center.